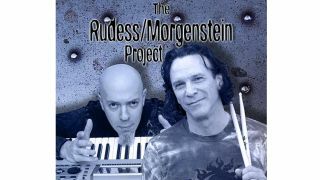 Dream Theater keyboard master Jordan Rudess and Dixie Dregs/Winger drum icon Rod Morgenstein are getting their old gang the Rudess Morgenstein Project together again for a select number of shows in the US next month. Morgenstein tells MusicRadar that the duo have recorded a sizable amount of new material as a possible follow-up to their 1997 self-titled album. "The only problem we have is finishing things," he says. "With our schedules, it's difficult to know if and when we will ever get to it." He adds that "some of it is really, really good." In recent years, RMP have performed in Poland, Costa Rica, Venezueala, Mexico, Germany and the UK. After a well-received show at Boston's Berklee College Of Music this past summer, the two decided to fit in more dates before the year was up. "We just have a great time hanging out and jamming," says Morgenstein. "Whenever our schedules can line up, we're going to try to do this sort of thing." Morgenstein figures that setlists will include material from the original RPM studio album along with some selections from Rudess' solo discs. In addition, the two will perform the title track to Emerson, Lake & Palmer's Tarkus, which Rudess covered on his 2007 album, The Road Home.